Sigfox Device with 10 year Battery life! Really? Much has been written about the low power consumption of Sigfox devices with battery life of 5 or even 10 years being suggested. But are these battery lives really achievable? Well I guess it depends on the application, the size of the battery and what is written in the small print to justify the projected battery life. Lets use the car analogy, if your car is parked in front of your home all day, then your tank of fuel is going to last a long time. If you drive on the motorway at 120 km/h constantly, then your fuel will not last a day. A parallel, can be drawn with battery powered IOT devices. The size of the battery, the update frequency and power consumption of whatever other activity it completes all determine the life of the battery. Motion detection is widely used for many applications to put the device in a low power state if inactive. Many device manufacturers specify a long battery life based on limited usage or a max number of messages per day. At HidnSeek we have developed a product that can deliver maximum battery life without compromising on any of the above mentioned factors using energy harvesting and availing of natural sunlight. The Digitraq PV can operate with 144 messages per day and 144 GPS fixes per day without depleting battery life. A number of the prototype GPS tracking devices are still in operation after 1.5 years with very healthy battery levels but the ultimate test was to test the device while constantly in motion and hence triggering GPS fixes and Sigfox communication every 10 minutes. For this, we monitored a device installed on an offshore asset in the Atlantic ocean and to add to the challenge we started the test on a cold winters day in January with limited daylight hours and light of low intensity. Subzero temperatures reduced the efficiency of the battery by up to 20%. 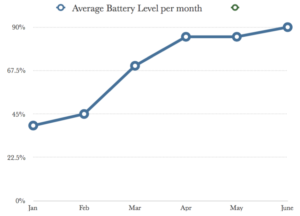 We started out Jan 31st with a device that had 40% charge and by June 8th, the battery level was sitting at 87% having transmitted every 10 minutes for over 4 months. 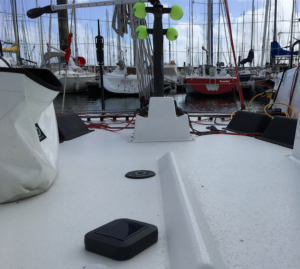 With a large battery and restricted use, many Sigfox devices will demonstrate long battery life but for demanding applications where the user does not want to compromise on battery size or performance, Digitraq PV offers a unique solution. HidnSeek designs and manufactures a range of Tracking products and would be delighted to address your logistic or tracking challenges.